Windows 7 3D screensaver with free moving 3D T-Rex. Try animated Tyrannosaurus Rex and get an unbelievable experience of virtual dinosaur screensaver for free. This Tyrannosaurus 3D screensaver is also compatible with Microsoft Windows Vista and Windows XP. T-Rex was a fierce predator that walked on two powerful legs in Cretaceous period forests. This meat-eater had a huge head with large, pointed, replaceable teeth and well-developed jaw muscles. The dinosaur had tiny arms, each with two fingers. Each bird-like foot had three large toes, all equipped with claws. Tyrannosaurus had a slim, stiff, pointed tail that provided balance and allowed quick turns while running. Its neck was short and muscular and body was solidly built but its bones were hollow. The king dinosaur was up to 12.4 m long, about 4.6 to 6 m tall and was roughly 5 to 7 tons in weight. 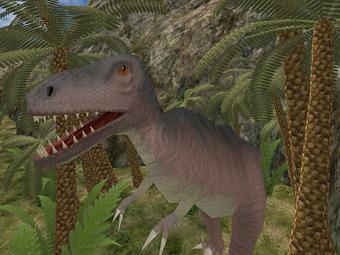 Age of Dinosaurs 3D includes the animated Tyrannosaurus Rex and other popular dinosaurs. 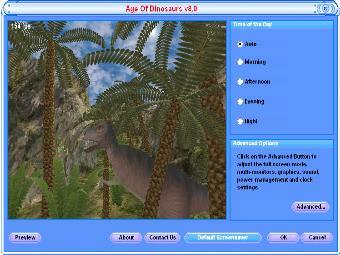 Click on the link below to learn more about the Age of Dinosaurs 3D Screensaver, If you want to turn your computer monitor into a virtual dinosaur world.